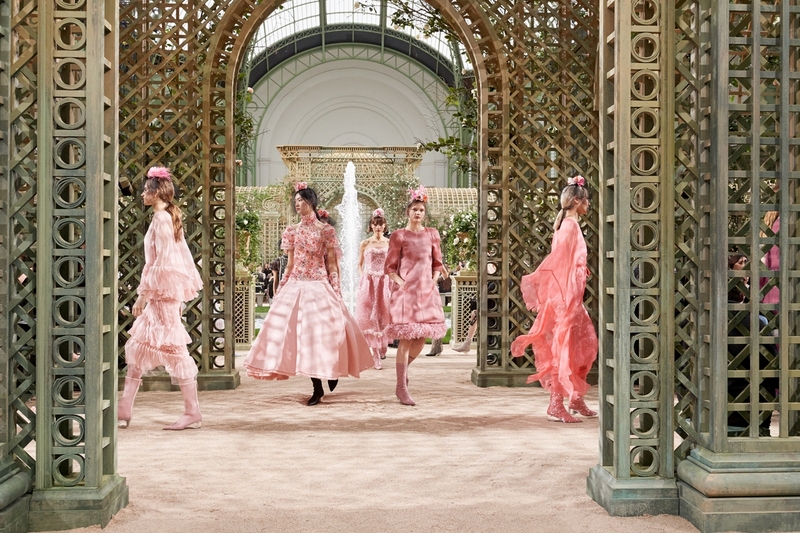 This Tuesday, October 3rd 2017 at the Grand Palais, Karl Lagerfeld presents the CHANEL Spring-Summer 2018 Ready-to-Wear collection within a décor of rocks and water evoking the Gorges du Verdon, a famous canyon with multiple waterfalls located in the south of France. This season, the designer writes a story in aquatic tones. An iridescent rainbow palette, scintillating gold and silver echoing the reflections of the sun and the moon on the water’s surface, hazy aqua prints in blue and white, luxuriant greens, delicate pinks and vibrant shades imbued with the energy of nature, all envelop the Spring-Summer silhouette. Defined by wide shoulders, described as “tumbling” by Karl Lagerfeld, or by ailerons, the structured line is softened by an ethereal fluidity. From Lurex tweed to crushed-smooth silk, from chiffon to lace and the richly embroidered drops of water, each time it’s a question of play between light and water. Play that touches the materials too: leather is partnered with tweed on bra tops and mini-skirts, tweed patchworks swathe dresses in bold colours. Dresses and wide jackets come in woven tweed extended with fringes that quiver like tall aquatic plants while coat-dresses flow with shimmering Lurex threads. The suit jacket is paired with cropped trousers in organic tones, with a geometrically stitched dress, or an iridescent short skirt trimmed with twisted braid. Contrasting strict and supple, short and long… XL blouses in white chiffon, knotted with a scout scarf, are worn with straight mini-skirts. Strapless chiffon sheath dresses with parquet pleating are finished with diaphanous coquillé flounces. A call to lightness and softness is illustrated by the dresses in crushed, frayed lace or in pleated silk. Dresses in waffled chiffon embroidered with crystal pendants accompany dresses with pleats, and others in ribbons and mesh with flounced sleeves that undulate like waves. With his elegant humour, Karl Lagerfeld accessorises the CHANEL woman with little wide-brim hats, capes, fingerless gloves, rainboots and thigh boots in transparent plastic. The water drop earrings are accompanied by sautoirs and necklaces of crystalline beads. On arms, the bags are worn in accumulation and become waterproof: this season, CHANEL’s GABRIELLE bag is in “needled” PVC and in rubber while the BOY CHANEL bag is in iridescent PVC. Like protective cocoons, the quilted shoppers in transparent PVC carry leather clutches and small rain capes serve as trench coats for all bags. A coated canvas printed with the logo and camellias dresses sporty bags while the gradated and embossed nylon adorns the XXL shoppers. Small backpacks alternate PVC and patent leather. The 11.12 bags embellished with pastel-hued iridescent sequins answer the minaudières in crystal Plexiglas, embroidered with reflecting sequins or entirely swathed in rhinestone. 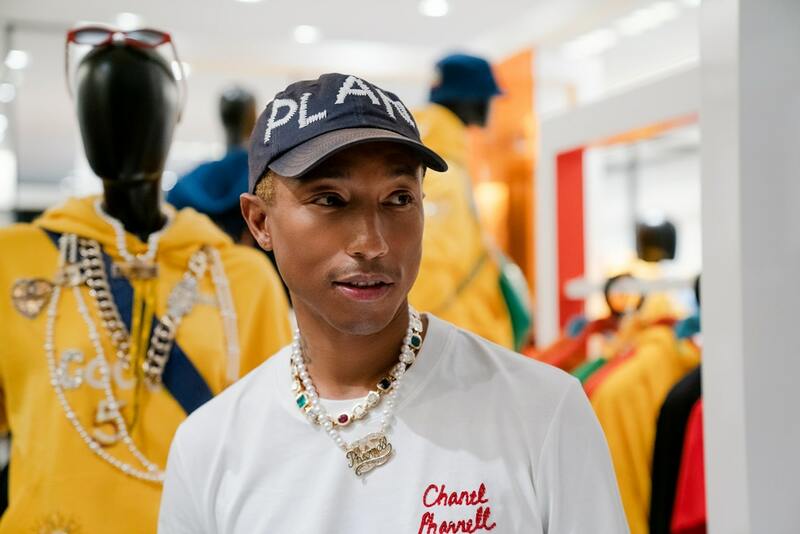 The ambassadors G-dragon, Marine Vacth, Caroline de Maigret, Anna Mouglalis, Liu Wen and Alessandra Mastronardi, the actresses Monica Bellucci and Clémence Poesy, the singers Ibeyi, as well as Cindy Crawford and Inès de la Fressange, applauded the creativity of Karl Lagerfeld for the CHANEL Spring-Summer 2018 Ready-to-Wear collection.